This is a Mass Effect Andromeda weapons page on the . Here you’ll find information about the plethora of weapons used in Mass Effect Andromeda. The Kett Carfalon blade can directly inject the user’s hand with a variety of neurochemical stimulants. The Carfalon reinforces the body’s reward mechanisms, allowing a combatant to overcome pain and fatigue after successful strikes. 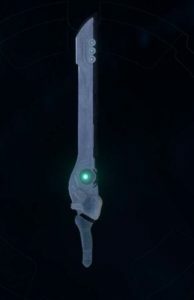 The weapon’s ability to adapt to various species suggests the Kett occasionally give them to favored vassals.